Portraiture has always held an important place in Michael Andrews’s practice as a painter, particularly in his later career. Earlier works such as 'The Colony Room I' (1962) or 'The Deer Park' (1962) are well-known as examples of group portraiture where the faces of Lucian Freud or the photographer John Deakin emerge from the crowd as though from memory, picked out by the artist as recognisable elements. Familiar faces in these group portraits imprint themselves as nodes of personal contact from a sea of indistinct motion. 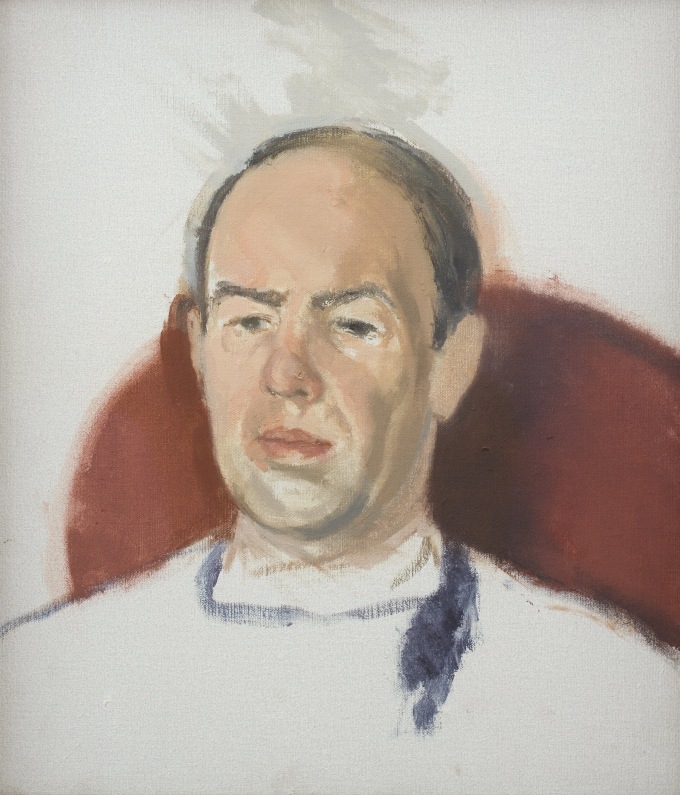 Later portraits, like the present work of the long-established London art dealer Anthony D’Offay, naturally take on different but connected role within Andrews’s painting and personal relationships, dislocated as they are from the earlier portrait work. Having been preoccupied by landscape for the preceding twenty years, the dawn of the nineties and, perhaps, the artist’s intimation that his life was coming to an end, triggered a desire to again depict those closest to him, this time on a modest scale. Beyond D’Offay, Andrews’s partner June was painted as well as friends Colin St John Wilson, David Astor, and Jane Willoughby. Earlier in life Andrews had reflected on portraiture, stating ‘All true appreciations of people are bound to be blurred (I think this goes for images too). Finding a bit here, a bit there, - its all approximate. Everything is “more or less” in my opinion.’ (Tate catalogue, 2001, p.14) Approximations are certainly made in this impression of Anthony D’Offay. Andrews’s brushwork holds a loose association with the image of his friend and gallerist as he sits patiently for the work to be completed. Indeed, most later portraits by Andrews are remarkable by being posed portraits, painted from life rather than the snapshot-like portraits from earlier in his career which were in fact completed from a mixture of photographs, memory, and life drawing. But as Andrews suggests such approximations made when drawing from life allow him to access the ‘true’ representation of his sitter; their character is revealed accurately and more potently as we experience their emotional attributes appearing through the fog of perception with which the artist battles. In a letter held at Tate Archive, Helen Lessore explained to Andrews her feelings regarding one of his portraits: ‘Your picture… has the most remarkable quality, that it convinces me that it exists, in the dark while I am asleep, and that things happen in it which I don’t see – that man has been somewhere else in the night – his past and future exist, it is only that its just at the one particular moment he passes the point in the circle where I can see him.’ (Helen Lessore to MA, 2 July 1960 Tate Archive) Although these words were written on 2 July 1960, they could easily apply to this portrait and the series of portraits produced towards the end of Andrews's life. Interior, past, present, and future lives are vividly evoked despite the feeling that these sitters are only partially or elliptically present. In this work, it is unclear whether the red area which forms D’Offay’s backdrop located in a chair or a wall, or is a delocalised patch of colour drifting through the image like one of the artists iconic balloons from his ‘Lights’ series. The feeling of being slightly out of joint, or of drifting between sharp and soft focus, between the firm centre of a memory and its hazy boundaries, is abundantly present in this portrait. The focussing principle remains Andrews’s exploration of his personal relationship with D’Offay. The relationship between artist and dealer began to deteriorate shortly after this work was completed. The painting’s eloquent, sketch-like hesitancy suggests the cracks may already be apparent. ‘The point’ Andrews mused in an early notebook, ‘is to know where one stands in relation to everything and then to get to know a bit more and then to get into a better relation, into right relation, with everything.’ (Tate catalogue, 2001, p.15) These words place portraiture, as a document and negotiation of a relationship, at the very heart of Andrews’s achievement as a painter. It shows him to be a painter not of life in any public sense but of the psychological landscape he experienced and shared with those around him. Michael Andrews was born in 1928 in Norwich, England, and died in London in 1995. He gained a BFA from the Slade School in 1953, and was a member of the "Norwich Twenty" group as well as being associated with the circle of painters supported by Helen Lessore at the Beaux Arts Gallery, London and later described by R.B. Kitaj as the School of London. Those close contempories included Francis Bacon, Lucian Freud, Frank Auerbach and Leon Kossoff. Together they became know for exploring the potential of human figure in art, often painting from life in innovative style that tested the limits of their medium. However, Andrews is somewhat unsusal within this group as the majority of his paintings after 1970 are devoid of people. Initially his work was associated with post-war existentialism but through subsequent decades, as landscape became and increasingly dominant presence in his work, a diffuse atmosphere of a heightened or dreamlike reality came to characterise Andrews’s style. Often working in distinct series, certain themes occupied Andrew through the seventies and eighties including Ayers Rock following a visit to Australia and experiences of aboriginal culture, and the Scottish landscape experienced through deer stalking. He died of cancer at the age of 67 and is now hailed as one of the most significant British artists of the post-war era. Institutional collections in which his work features include Metropolitan Museum of Art, New York; National Gallery of Victoria, Melbourne; The Whitworth, The University of Manchester; Museo Thyssen-Bornemisza, Madrid; Arts Council Collection, Southbank Centre, London; Calouste Gulbenkian Museum, Lisbon; and Scottish National Gallery of Modern Art, Edinburgh.